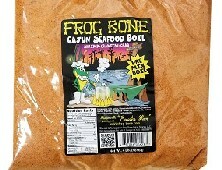 Frog Bone Cajun Seafood Boil was created by the "Boudin Man" from Madisonville, Louisiana. 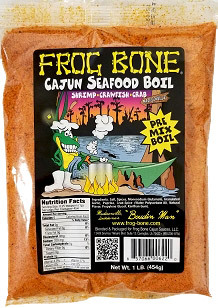 This cajun seasoning is made with a specific blend of seasonings and spices to create the perfect flavor and spice for your seafood, veggies, potato, and meat entrees. The Seafood Boil comes in a 1 pound bag that can season 10 pound of crawfish/crayfish, or 15 pounds of shrimp, or 2 dozen crabs. This seafood boil/ seasoning is a pre- mix boil. Zatarain's Crab Boil 73 oz.